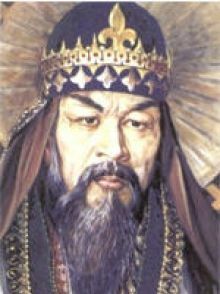 Kazakh Khan, one of the founders of the Kazakh Khanate and its ruler, presumably, in the years 1474-1480. In Genghis Khan's son Jochi Khan, his son, Timur Tukai, his son Uz-Timur, his son Hodge, his son Badakul-angle lens, his son Urus Khan, his son Koirchak Khan, his son Barak-Khan, his son of Abu Said, surnamed Jani Beg Khan. It had nine children in this order: Irandzhi, Mahmoud Qasim, followed by ITIC Dzhanish, Kanabar, Tenishev, Usuk, Dzhuak. Some of the descendants of Tukai-Timur Khan, for example Kirei Khan and Jani Beg Khan, the names of the fathers who are mentioned in detail in the list of names khakans place of the fat-Timur, came out of the circle of submission and obedience and chose to leave their homeland.